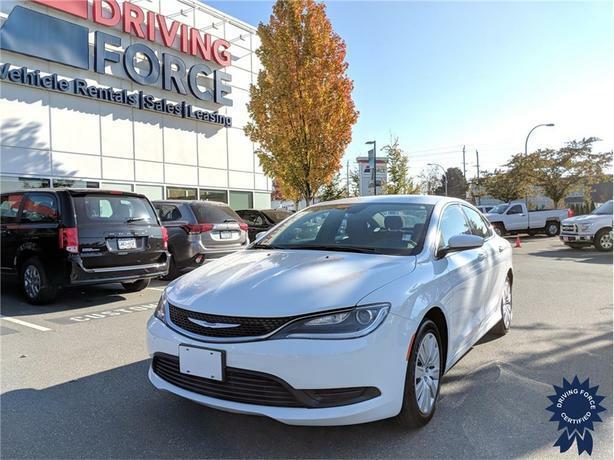 This 2016 Chrysler 200 LX 5 Passenger Front Wheel Drive Sedan comes with a 9-speed automatic transmission, 3.73 axle ratio, engine auto stop-start feature, keyless start, 160-amp alternator, touring suspension, premium cloth bucket seats, 17-inch wheels, light tinted glass, LED brakelights, perimeter/approach lights, two 12V DC power outlets, power door locks with autolock feature, tire specific low tire pressure warning system, 60-litre fuel tank, and GVWR rating of 4,610 lbs (2,095 kgs). The 2.4-litre Tigershark MultiAir I4 gas engine provides 184 horsepower at 6,250 RPM and 173 lb-ft of torque at 4,600 RPM. Touch base with us to discuss purchasing or financing options that are right for you and experience the difference you will only find at DRIVING FORCE Vehicle Rentals, Sales and Leasing.